When care needs increase and around-the-clock supervision becomes necessary, many families wonder if remaining at home is still a viable option for their senior loved one. Finding a reliable caregiver is sometimes difficult, and few have the flexibility to remain in the home around-the-clock. Home Care Assistance of Guelph, ON, solves this problem by providing trusted and reliable 24-hour care that remains unmatched in the senior care industry. 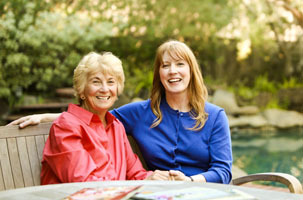 Our live-in home care is personalized, one-on-one care that is customized specifically for the client. Our Care Managers evaluate a senior’s current needs and abilities and work closely with the senior’s family and team of medical professionals to develop a care plan that respects the dignity, independence, and health goals of the senior while promoting safety and comfort. Home Care Assistance is so confident in this model of care that we offer a satisfaction guarantee and never require a client to sign a long-term contract or pay a cancellation fee. Home Care Assistance in Guelph goes beyond providing basic care and considers the holistic needs of each client. Our Balanced Care Method works perfectly in a setting where 24-hour care is provided and utilizes a professionally endorsed, proven method for promoting longevity, health, and happiness. It is one of our exclusive care methods, and our caregivers are trained in BCM as part of our effort to provide the highest quality, most advanced home care available. At Home Care Assistance, we work diligently to help your loved one feel safe and secure while providing you with valuable peace of mind. To learn more, contact our office at (519) 954-2111 and schedule a free, no-obligation consultation with a devoted Care Manager.